Description: Individually numbered limited edition! Only 3000 copies! Available for the first time on 180-gram audiophile LP! All-tube mastering from the analog master tapes by by Chris Bellman at Bernie Grundman Mastering! 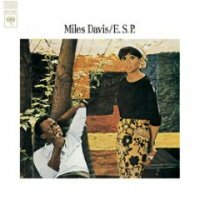 "ESP marks the beginning of a revitalization for Miles Davis, as his second classic quintet -- saxophonist Wayne Shorter, pianist Herbie Hancock, bassist Ron Carter, and drummer Tony Williams -- gels, establishing what would become their signature adventurous hard bop. Miles had been moving toward this direction in the two years preceding the release of ESP and he had recorded with everyone outside of Shorter prior to this record, but his addition galvanizes the group, pushing them toward music that was recognizably bop but as adventurous as jazz's avant-garde... [With] a de-emphasis of composition in favor of sheer improvisation, elastic definitions of tonality -- they created a unique sound that came to define the very sound of modern jazz. Certainly, many musicians have returned to this group for inspiration, but their recordings remain fresh, because they exist at this fine dividing line between standard bop and avant." Recorded January 20-22, 1965 at Colombia Studios, Hollywood. Originally released by Columbia as CS 9150. Stereo.